Oregon Humanities magazine is an award-winning triannual publication (spring, summer, and fall/winter). 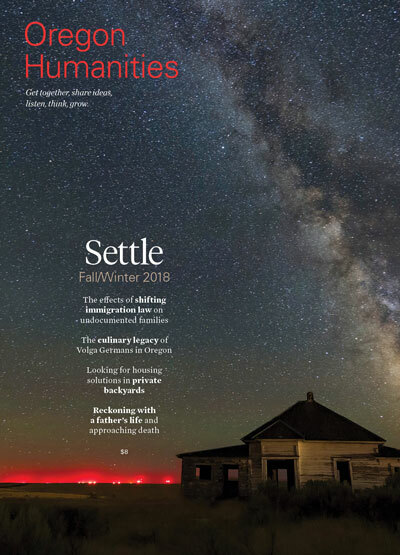 As a publication of ideas and perspectives, Oregon Humanities magazine offers a forum through which Oregon writers, scholars, and readers can use the humanities to explore timeless and timely ideas and themes. We only accept submissions of nonfiction writing and artwork when we announce each issue’s theme. All personal essays and features focus on a particular issue’s theme. Field Work, Bright Idea, Q&A, and What I Think articles are not tied to theme but should be timely, focus on the humanities, and of interest to Oregonians. We distribute our call for submissions through media, literary, and academic organizations, as well as through our enewsletter mailing list. Please sign up for the Oregon Humanities enewsletter to guarantee that you receive calls for submissions for Oregon Humanities. We exclusively publish work by Oregon-based writers. Please acquaint yourself with Oregon Humanities magazine before submitting your work. We receive many more submissions than we can use, so you will dramatically improve your chances of being published in the magazine if you’re familiar with the types of material we tend to buy. You can read the current issue’s contents online or request a sample copy by calling the Oregon Humanities office at (503) 241-0543. We prefer to consider completed drafts but we also accept queries and proposals that concisely articulate the focus, argument, and content of your proposed article, as well as the resources you will use and any particular experience you have with the subject matter. Please include any relevant supporting material (e.g., resume or curriculum vita, professional affiliation or publication background, and/or clips of recently published work) with your query or proposal. We will only accept completed drafts of Posts and personal essays. We pay on acceptance, after the satisfactory completion of required revisions. Payment ranges from $50 to $200 for shorter department pieces and $300 to $800 for personal essays and features; payment varies depending on the length and complexity of the piece, and whether it is an original, commissioned work or a reprint or adaptation of an existing piece. We will consider previously published work and excerpts and offer a modest honorarium for these works. We do not pay for Posts. Please see below for specific requirements for each magazine section.We prefer to receive submissions and queries electronically. If your query is longer than one page, please attach it as a Word document and make sure that your name and contact information are included on the attachment. We will also consider submissions by postal mail. Please note that at this time, we do not accept unsolicited submissions of poetry and fiction. Posts, personal essays, and feature articles always focus on a particular issue’s theme. Please be sure to sign up for our enewsletter (sign up box is in the far-left column) to receive notice of upcoming themes. Posts is the “readers write” section of the magazine that encourages readers to reflect on each issue’s theme. Writers who don’t have clips or prior publishing experience will have the best chance of being published in this section of the magazine. Posts submissions should be no longer than 400 words. Payment for Posts is in the form of complimentary copies. Personal essays should not be merely anecdotal or narrative, but should also offer an argument, reflection, and revelation that illuminate each issue’s theme. Personal essays are usually no longer than 2,000 words. Features tend to be either scholarly essays that are written for a general audience or articles that use the various techniques of magazine journalism (i.e., reportage, interviewing, character development, narrative). Features in Oregon Humanities differ from those in other publications because they employ the methodologies of the humanities, including critical inquiry, analysis, and reflection. All features, no matter how subtly, should make an argument and offer a theory and supporting evidence that help our readers consider the theme in new and surprising ways. Features are generally between 2,500 and 4,000 words long and must consider a particular issue’s theme. Field Work, Q&A, Bright Idea, and What I Think do not focus on each issue’s theme. We accept queries and submissions for these sections on a rolling basis. Field Work articles look at humanities work in the state of Oregon. These need not be related to Oregon Humanities programs and events, but should both report on and offer insights about people, activities, and events in Oregon’s humanities community. We publish no more than four Field Work pieces per issue. Field Work articles are 200 to 300 words long. Q&A articles focus on Oregonians whose work is significant in one of the many disciplines of the humanities. Q&As are 500 words long, but we sometimes publish longer Q&As if the topic relates to an issue’s theme. Bright Idea articles explore innovative or intriguing humanities projects and programs in Oregon that have a public engagement or community-based focus. These articles are 500 words long. What I Think columns are opinion pieces that take a strong stance about a humanities-related topic. These columns are 500 words long. Please note that we no longer accept book reviews. We instead publish staff-written capsule descriptions of new books by Oregonians in our Read. Talk. Think. section. To have a book considered for this section, please send a review copy to Oregon Humanities magazine, 921 SW Washington St. #150, Portland, OR 97205.